Constellation Group LLC has now completed over 26 major underground utility thermal grouting projects in the United States and Canada. Thermal grouting is designed to dissipate heat from the electrical conduits, increasing efficiency and insulation lifespan and reducing long term cost. CGLLC has been working with Electric Power Research Institute (EPRI) to develop national thermal grouting guidelines for the Electric Utility Industry. CGLLC has demonstrated that long distance thermal grouting for heat dissipation can be accomplished. Using proven project management skills and thorough planning, all of these projects were finished on schedule. Thermal resistivity (rho) is typically .50-.80 range for set moisture content, depending on grout design. Woodbridge Energy, New Jersey – Six bores totaling 11,000 feet of HDD thermal grout- completed in 7 days. PSE&G, New Jersey – Multiple short crossings 110-620 feet. 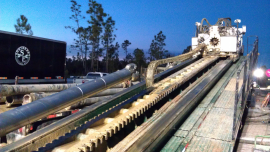 Orange Beach, Alabama- (Wolf Bay) – Working with Southeast Directional Drilling, CGLLC successfully thermal grouted the longest electric utility casing- 6131 feet (or 1870 meters). This was a cased water-filled bore, 36 inches in diameter with five 10 inch and one 8 inch conduits. Nearly 670 cubic yards of grout were placed in two grouting days. It just gets longer and longer. 115KV, 1000A. Also the longest continuous XLPE cable project for its size. BC Hydro, Vancouver, BC – The first major uncased, drill mud filled HDD bore successfully grouted for 230KV transmission. 810 meters long, 1.1 meters in diameter, 410 cubic meters of thermal grout. This is the first time CGLLC worked with the Owner and Engineer (BC Hydro and Golder Associates) during the design phase and then the contractor (Michels Canada). This widely watched project is another world class standard grouting project completed by CGLLC. This project was Runner-Up for NASTT Project of the Year. Austin, TX – 2 each 2000 foot 30 inch diameter conduits-in-casing. Approximately 365 cubic yards of specialized thermal grout. This set the standard for all other projects. Detroit, MI – 2 each 450 foot conduits-in-casing. Approximately 150 cubic yards placed in one day of thermal grout. Colorado Springs Utility, CO – 950, 850, 500, 450, 400 foot conduit-in-casings 600 cubic yards of thermal grout. 115KV. Platte River Power Authority, Longmont, CO – Working with Gabes Construction, completed 7 jack and bore grouting operations (from 100 to 200 feet) 230 KV. CGLLC has demonstrated that long distance thermal grouting for heat dissipation can be accomplished. Using proven project management skills and thorough planning, all of these projects were finished on schedule. Thermal reisistivity (rho) is typically .50-.80 range for set moisture content, depending on grout design. Video Above: This is how a basic thermal grout for short bores (less than 750 feet) should look- click on the picture to watch the video. Two grouts with similar mix designs from two manufacturers had different TRs. Always test your mix design for TR. This grout has the consistency of loose oatmeal and a TR of 0.5 at 2% moisture.